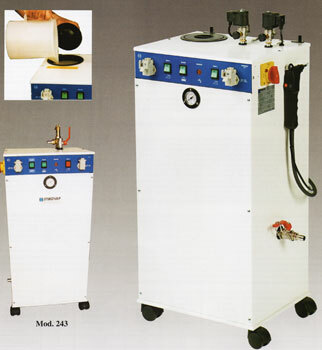 Model 223 is an automatic, electric steam generator, manufactured to feed 2 steam irons with a minimum consumption of electric power. It is designed to make easy reaching of all parts for cleaning and inspection operations. Thanks to its great possibility of use, the Mod. 223 is the ideal to satisfy all demands. Some characteristic of this generator are: boiler in steel with automatic control of water level, duplex safety to protect heating elements against higher temperatures, automatic pump for water feeding into boiler, switch for boiler heating elements, duplex switch for irons ignition, light "emergency" for boiler, ball valve for deposit and water outlet, electric valve with control of steam flow, safety valve. 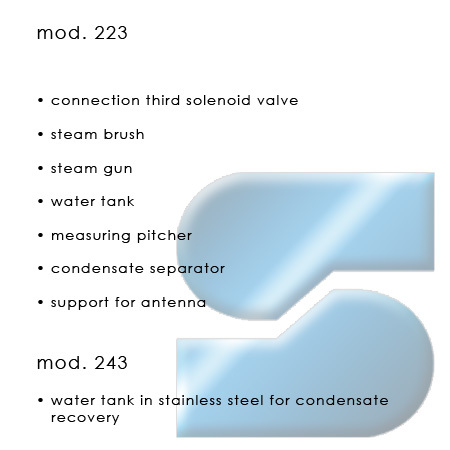 Model 223 can be connected directly to water network or by a tank built-in (autonomy 10 hours, with 2 steam irons) it is independent completely and can be placed where the water network is not there. Model 223 is compact, solid generator and safe to the service of the operator, manufactured by new European rules. Model 243 is an automatic, electric steam generator, planned to produce big quantities (15-30 Kg/hour)of steam with a reduced consumption of electric power. Thanks to careful studies concerning the levels of water into boiler, under the same electric power of heater, the Model 243 con keep working pressure where differently other steam generators are not able to make it. 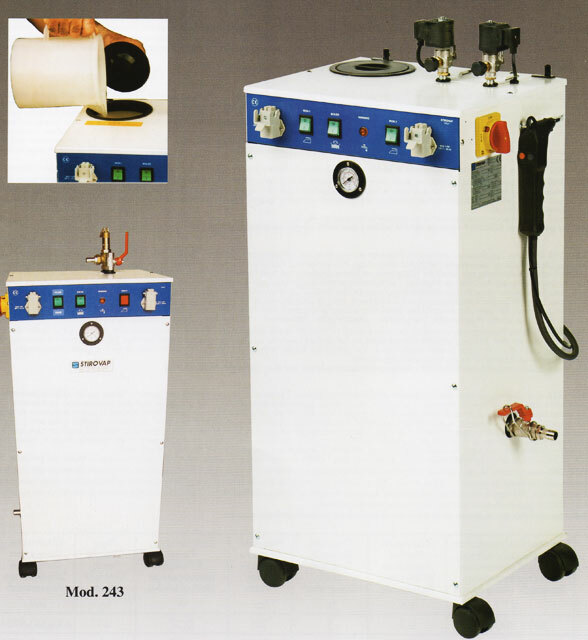 The Model 243 is also equipped with double heater controlled by a push button where in case, it can work at half power by reducing further on the consumption of electric power.